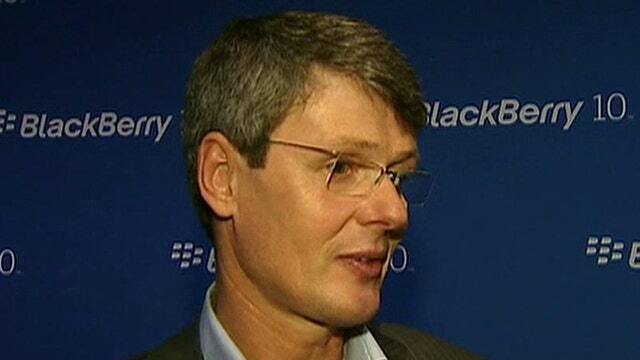 BlackBerry CEO Thorsten Heins on the release of the BlackBerry 10 and Lenovo buyout rumors. Shares of Research in Motion (NASDAQ:RIMM) tumbled into the red Wednesday after the smartphone pioneer officially unveiled the long-awaited BlackBerry 10 platform in hopes it will help resurrect sales. In a surprise move, RIM also said it has decided to change its name for the first time since its inception in 1985. The company will now officially go by "BlackBerry," trading under the symbol "BBRY," a move it likely hopes will further distance itself from its bleak past and better align with its strategy and core product. With 70,000 apps, the BlackBerry Z10, which boasts a 4.2-inch touch screen display and a width of just 9 millimeters, is launching with more applications than any first-generation operating system. The phone also has a smart 8-megapixel camera and faster browser. RIM also unveiled a new keyboard phone called the BlackBerry Q10. However, at a global launch in New York City of the BlackBerry Z10, the new the first handset under its new BB10 platform, investors seemed unimpressed. Shares of the Canadian-based smartphone maker tumbled as much as 7.4% to a low of $14.41 on Wednesday. The sell-off is a disappointment for RIM, which has been generating buzz about the BlackBerry 10 platform for months and is hopeful it will help put the company on track to better compete with larger rivals Apple (NASDAQ:AAPL) and Google (NASDAQ:GOOG). How do you think the new BlackBerry will stack up against other smartphones? Tell us in the comments section! The speculation regarding BB10 caused RIM’s shares to surge by more than 100% over the last six months on hopes about the success of the new platform.